March 29, 5:30 to 7:30 p.m. at the HUC Museum (1 West 4th street). RSVP required (jewishartsalon@gmail.com). Jewish Art Salon session with curator Laura Kruger, and artists Helene Aylon, Carol Hamoy, Rachel Kanter and Laurie Wohl. HUC Museum curator Laura Kruger will discuss the current exhibit A Stitch in Jewish Time. Jewish Art Salon artists Helene Aylon, Carol Hamoy, Rachel Kanter and Laurie Wohl will talk about their work in the show. Books of Moses with transparent parchment and highlighted with pink marker over words of misogyny and between words where a female presence was omitted (such as in the passages of the 'begots'). This acknowledgment of the "erased" foremothers is expressed in The Foremothers' Challah Cover. Aylon's 2005 series of altered photographs, Wrestlers, evokes her yearning for past foremothers and in the current series, Turnings, she posits herself as a future foremother. Aylon's solo show at the Andy Warhol Museum May 7 to July 3, 2011 is part of the Warhol Museum's year-long theme, The Word of God. 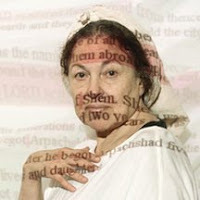 The memoir on her orthodox girlhood in Borough Park and emergence as a feminist artist will be published by The Feminist Press in April, 2012. Rachel Kanter holds a B.F.A. in ceramics from Syracuse University and an M.F.A. in ceramics from Rochester Institute of Technology, School for American Crafts. She has shown her work at the Jewish Museum, the Contemporary Jewish Museum in San Francisco, American Jewish University, the Society for the Advancement of Judaism and Temple Emanu-El in NYC and the Jewish Cultural Center in Chattanooga, Tenn. Her piece “Fringed Garment” is in the permanent collection of the Jewish Museum. In addition, she has lectured and given workshops at the Jewish Theological Seminary, Har Zion Temple in Penn Valley, Pa., Temple Adath Yeshurun in Syracuse, N.Y. and Congregation Habonim in N.Y.. 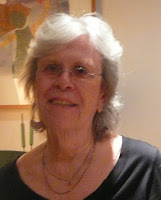 Her work has been featured in American Craft Magazine, Lilith Magazine, Hadassah Magazine, and Zeek. Laurie Wohl is an internationally-known fiber artist. 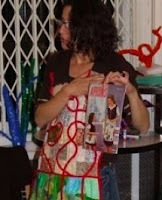 Her Unweavings® fiber art are held in the collections of the Museum of Arts and Design (NYC), the American Bible Society (NYC), The Constitutional Court of South Africa, and Catholic Theological Union (Chicago), among others. Her works have also been on long-term loan to the United States Embassies in Beirut, Vienna, Tunis, Cape Town and Pretoria. She has accomplished a number of liturgical projects, among them The Psalms Project (12 major works for the sanctuary of Fourth Presbyterian Church, Chicago), and the Talbot Bible Stoles Project (4 pulpit hangings for Madison Avenue Presbyterian Church, NYC). In 2003, Ms. Wohl received an Honor Design Award for The Psalms Project, from the Interfaith Forum on Religion, Art and Architecture (AIA). Wohl's work has been featured in numerous exhibitions, including the Philadelphia Museum of Jewish Art, Hebrew Union College, the South Bend Regional Museum of Art, and Catholic Theological Union (Chicago). Sponsored by the U.S. Department of State, she has given a series of lectures and workshops in Soweto, Johannesburg, and Pretoria, South Africa. Among her special projects has been an interactive set design for a full-length dance piece, “Unweavings,” for Jan Erkert & Dancers.